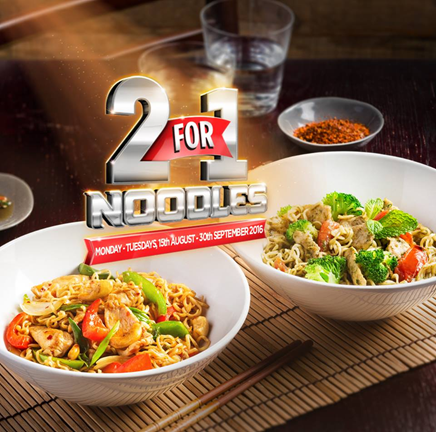 Star Card members, the 2 For 1 Noodle Special is back! Order your favourite chicken noodle dish from the 500’s range on our menu, or our vegetarian noodle dish (403) every Monday and Tuesday until the 27th September, and we’ll give you a second noodle dish absolutely free! This 2 for 1 Special is available for sit-down only. This offer is not available for take-away, delivery orders or third party delivery services. 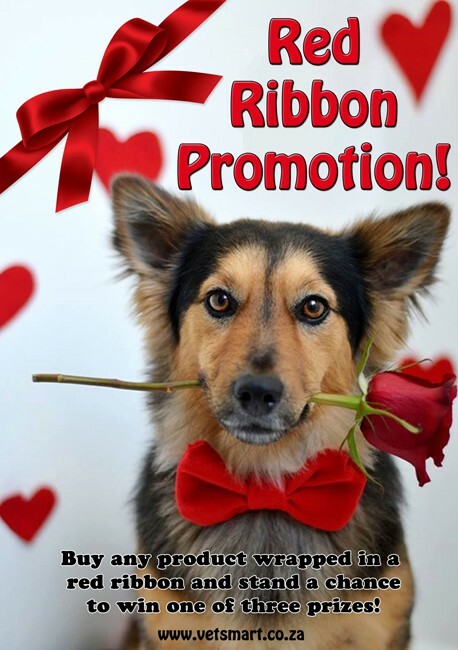 Buy any product wrapped in a red ribbon and stand a chance to win one of three prizes! 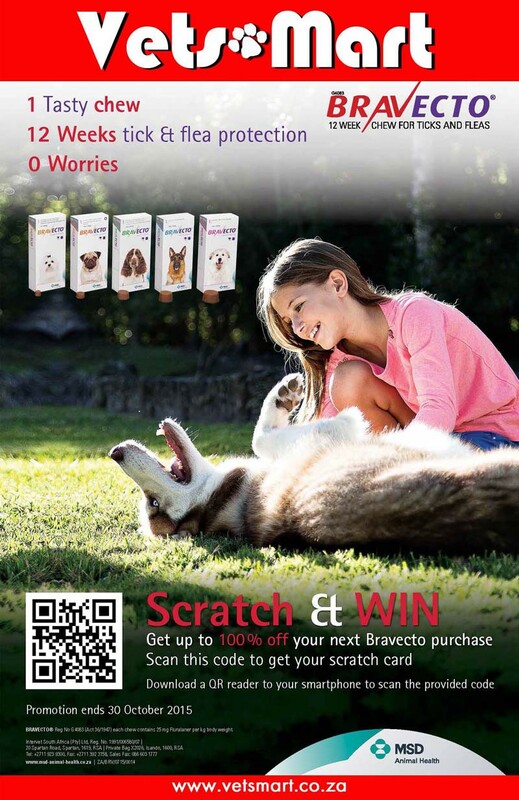 Get up to 100% off your next Bravecto purchase Scan this code to get your scratch card. Taste your way to Thailand. Order any main meal and stand a chance to win 1 of 4 trips for 2 to Thailand. Each holiday is valued at over R60000 - Competition closes 25 October 2015. 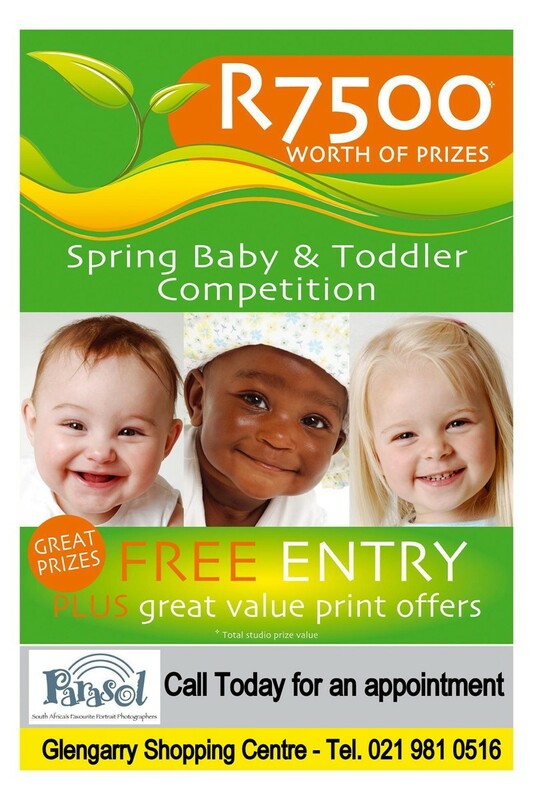 Great prizes free entry plus great value print offers. Spring competition! 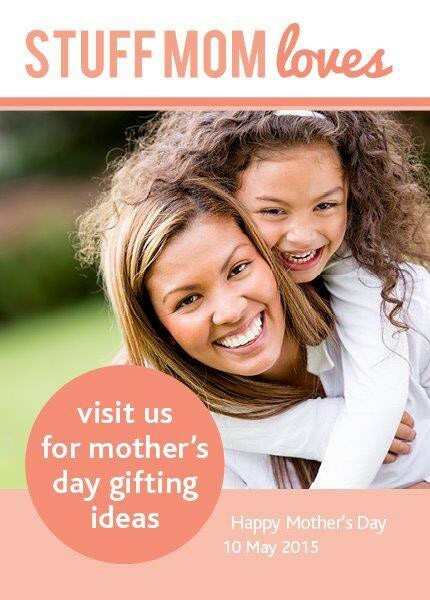 Win 1 of 6 hampers! 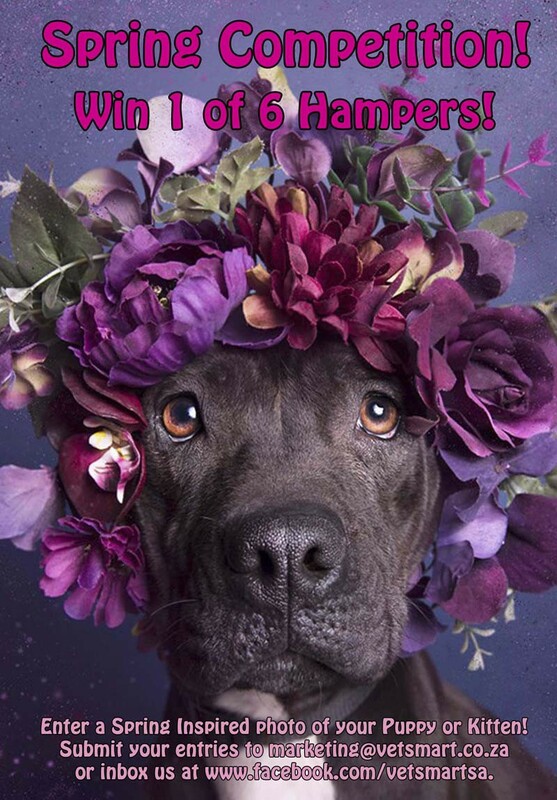 Enter a Spring Inspired photo of your puppy or kitten! Submit your entries to marketing@vetsmart.co.za or inbox us at www.facebook.com/vetsmartsa. 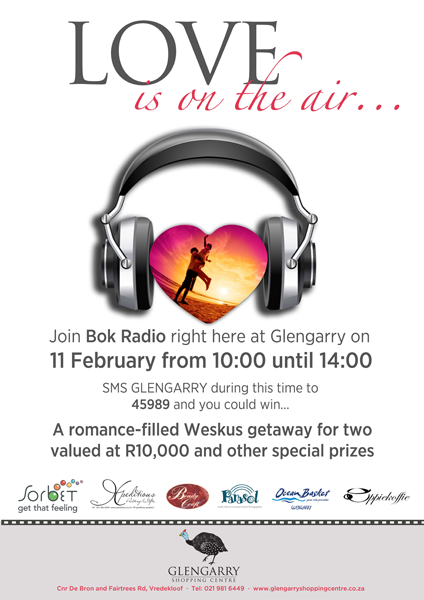 A romance-filled Weskus getaway for two valued at R10,000 and other special prizes. 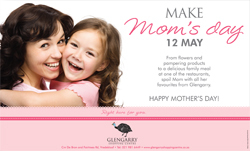 From flowers and pampering products to a delicious family meal at one of the restaurants, spoil Mom with all her favourite from Glengarry. 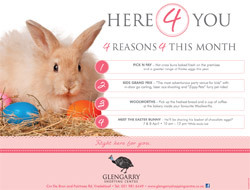 Find the Easter Bunny at the centre and follow his clues to discover yummy treats! 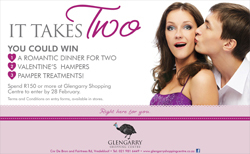 Spend R150 or more at Glengarry Shopping Centre to enter by 28 February. Terms and Conditions on entry forms, available in stores. 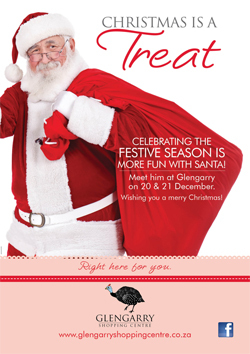 Celebrating the Festive Season is more Fun with Santa! Meet him at Glengary on 20 & 21 December. 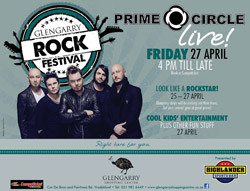 Glengarry shops will be rocking out their doors. Get your concert gear at great prizes! 1. 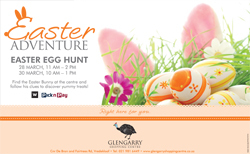 PICK N PAY - Hot cross buns baked fresh on the premises and a greater range of Easter eggs this year. 2. KIDS GRAND PRIX - "The most adventurous party venue for kids" with in-door go carting, laser ace shooting and "Zippy Pets" furry pet rides! 3. WOOLWORTHS - Pick up the freshest bread and a cup of coffee at the bakery inside your favourite Woolworths. 1. Beady Craft offers the latest in costume jewellery and supplies for the discerning crafter. Join a class in-store if you are just starting out. 2. Our bigger Woolworths will bring a wider variety of quality products. 3. Free basement Parking for your convenience. 4. We Thank You for your patience during the construction phase and apologise for any inconvenience. 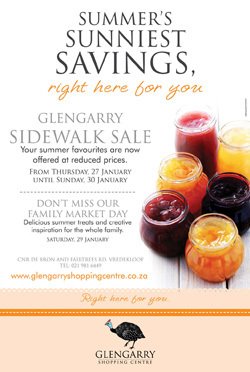 Glengarry will be having the most fantastic Side Walk Sale on 27, 28 and 29 Jan 2011. Visit us for Summer’s Sunniest Savings!! Delicious summer treats and creative inspiration for the whole family. 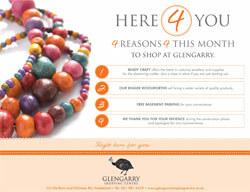 Glengarry wishes all its shoppers a blessed festive season! Kids, come and play at Glengarry while mom shops: In the courtyard there is a jumping castle, Father Christmas and ball pond. In the shop below Spur you can race like a Formula 1 driver at the Kids Grand Prix race track, there is also a cash cage, puppet theatre and jumping castle!! The first 15 kids on the day play for free! 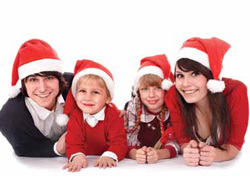 Click Here to read our Christmas Kids Entertainment.